Growing oyster mushrooms is fun, simple and a great addition to many gardens, yards, and any permaculture-oriented sustainable homestead. As gardeners we often like to grow flowers, veggies, and maybe fruit. We mulch our garden beds with straw or wood chips to retain moisture. We might use logs for a naturalistic edging. The plants grow in the soil, but what grows in the mulch or the edging? Mushrooms! Why Try Growing Oyster Mushrooms? 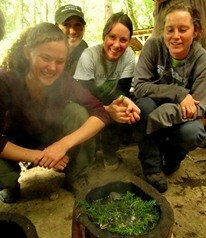 Fungus cultivation is not practiced by a lot of people today, mostly due to fear of the unknown. But after reading this article, you may go forth and embrace growing oyster mushrooms (Pleurotus ostreatus). 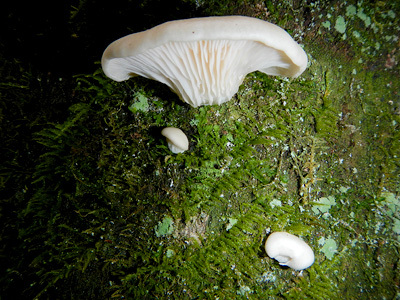 The oyster mushroom is one of the easiest to grow. I bet you can guess what it tastes like. The oyster is usually white in color, though different colored varieties have been recently cultivated. This mushroom is saprotrophic, meaning it eats dead and decaying organic matter. It is considered to be an incredible edible by mushroom lovers worldwide. There are many avenues one can take in the cultivation of this fabulous fungus. The first is growing oyster mushrooms from spore, which is similar to growing plants from seed. This is the most difficult and time consuming method which requires a clean room, petri dishes, and a laminar flow hood. Unless you are a fungus freak I don't recommend diving off of this platform. The next method of growing oyster mushrooms is the wood chip method. This is an easier process that requires less work. It involves purchasing mycelium from a commercial mushroom grower (I recommend Fungi Perfecti LLC), which comes in a mixture of deciduous tree sawdust and wood chips. Once the bag of mycelium arrives, you want to add more deciduous tree wood chips (alder, cottonwood, oak, and maple all work well). But there is one requirement of the wood chips you add: they must be pasteurized to prevent contaminant fungi from out competing the oyster mycelium. A mushroom gardener can pasteurize wood chips by heating them to 180 degree Fahrenheit for one hour. After this process the chips may be added to the mycelium, wetted, and grown indoors (in a perforated plastic bag) or outdoors in a shady location. Allowing the mycelium to run through the new wood chips and fruit at least once before moving outdoors to a garden will increase the chances of outdoor success. The last way to grow oyster mushrooms is via log culture. This is my favorite method because it allows me to practice benign neglect. There is an initial surge of work but after that the oysters turn the wood into a tasty treat. In late winter or early spring, cut down a live deciduous tree (the species mentioned above work well) that is between four and eight inches thick. Note the date and walk away. Three to four weeks later the enzymes in the tree bark that prevent fungal inoculation will have fought their last fight. The time is at hand to inoculate your tree. First you must cut the logs to the length desired. Three to four foot sections work well. Then you drill holes no less than four inches apart in a diamond pattern throughout the surface of the log. Now for the fun part: you take the plug spawn (which are little mycelium dowels) and hammer them into our holes. Once the log has all of its holes plugged, you cover the exposed wood on the ends, the exposed dowels, and any other wood from which the bark has been removed, with beeswax. 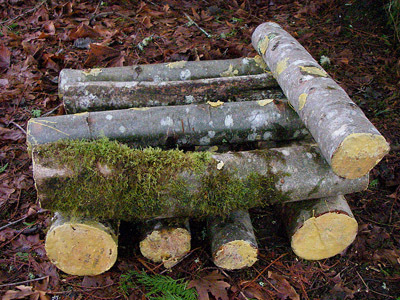 Then you stack the logs in a cabin shape in the shade or edge garden beds with them. Again, note the date and walk away. Between six months and two years after inoculation the logs will begin to fruit oyster mushrooms. In that wait time, if you live in a hot and dry area, you will need to keep the logs moist and cool. That is about all the maintenance that goes into growing oyster mushrooms on logs. 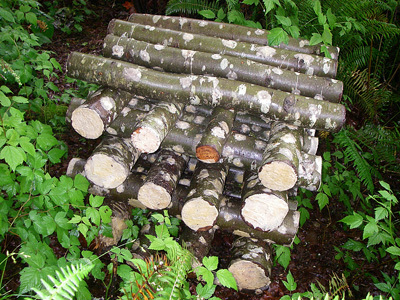 You can expect the logs to produce mushrooms for at least two years. 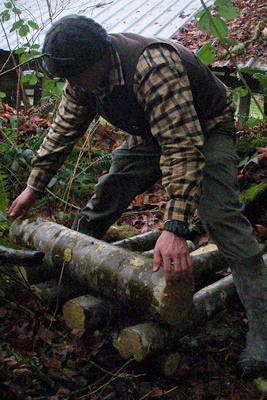 The harder woods will maintain their structure longer and therefore produce for longer periods of time. Mushrooms will grow in gardens whether we want them or not. Instead of allowing a little brown mushroom that may be poisonous to volunteer, let us add another yield to our gardens by growing oyster mushrooms in or around them. Enjoy!